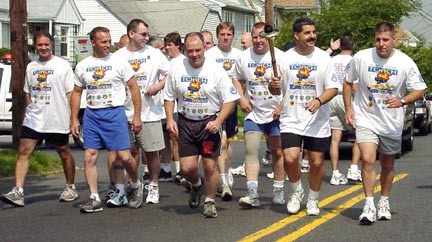 On June 2, 2000 about 10:00 a.m., the HHPD accepted the "Special Olymics"
torch from Lodi PD. Our PD carried the "Torch" to a brief ceremony held at Shoprite, then proceeded up Williams and along The Boulevard past the Circle. The torch was then presented to the Wood-Ridge PD near the border. NJ State Police and several Bergen County Motorcycle units assisted. About $5000 was generated by the HHPD for the Special Olympics.